When I started planning to post some 'sweet recipes' for Diwali, coconut burfi was on top of my list. Coconut burfi is an easy-to-make sweet as you need not be concerned too much about the right consistency of sugar syrup. 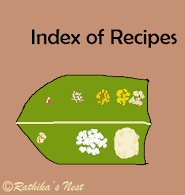 Moreover, you can make it with very little ghee when compared to other sweets. All the ingredients that you would need to make this sweet are normally available in your pantry. During my childhood, we had a few coconut trees in our garden and this sweet was made whenever there was a surplus of coconuts! Okay, let’s start making coconut burfi for this Diwali. Method: Grate the coconut using a manual, mechanical or electric grater. While grating make sure to leave 1-2 mm thick layer of coconut meat adherent to the shell. This way you would have white gratings and your sweet will also be white in color! However, I use a shortcut method at the cost the color of the burfi. I prefer to cut the coconut meat into pieces and grind them in a mixer using the whipper button 2-3 times. This is faster, but the coconut gratings are pinkish in color (Fig.1). Well, the burfi will taste the same, though it may have a pinkish hue! I leave the choice to you as to how to grate the coconut! Separate the cardamom seeds and powder them finely using mortar and pestle. Smear a tray with little ghee and keep aside. I have used a 1" deep circular plate for this purpose. Heat sugar with ½ teacup (100ml) of water in a kadai on medium flame till the sugar dissolves and syrup starts boiling (Fig.2). Allow the syrup to thicken till it becomes sticky – if you touch the syrup with index finger and press your thumb against it, the syrup will stick between the fingers when you try to separate them. At this stage add coconut gratings and mix well. Cook on medium flame, stirring continuously till the syrup is fully absorbed (Fig.3). Heat ghee in a spice pan, add cashew nuts and fry till they become light brown in color. Add ghee containing fried cashew nuts and cardamom powder to the coconut mixture. Blend together and keep stirring till the contents start to separate from the sides of the kadai forming a mass (Fig.4). Transfer the contents to a greased tray. Smear the under surface of a katori (small serving bowl) with little ghee and use it to flatten the surface (Fig.5). Allow it to cool for 5-10 minutes and later using a knife, cut it into small square pieces as shown in the following figure (Fig.6). After the sweet cools to room temperature, separate the pieces and store them in a clean, dry, air-tight container. If stored properly, coconut burfi remains fresh for 7-10 days.